It’s late in practice Thursday afternoon, and the Seattle Storm has just finished scrimmaging. Team members, legs tired, sweat dripping, line up around the basket to take free throws. It’s in these worn-out moments when mental and physical precision are key, after all. After a round of shots, Storm coach Dan Hughes brings his squad in for one more talk before dismissing them for the day. Practice is over. But not for Breanna Stewart. Stewart leads the WNBA in scoring (22.8 points per game) and is fourth in rebounding (8.1 per). The 6-foot 4-inch forward finds herself in the middle of an MVP-caliber season. And MVPs take extra reps.
She sets up on the other end of the practice court at Seattle Pacific University and begins working with her trainer, taking mid-range jump shots from the wing before eventually retreating behind the three-point arc. The former University of Connecticut three-time NCAA Player of the Year is pushing it so hard, in fact, that Hughes approaches her and her trainer to tell them to take it easy on her. “I’m fine,” Stewart assures, sweat dripping. This year, even her coach can’t stop her. Stewart’s work is paying off beyond even her individual stats. While the Storm haven’t made it out of the first round of the playoffs since 2010, as of August 7,the team boasts the WNBA’s best record at 22-7 (the next best is the Atlanta Dream’s, at 18-10) and has already clinched a playoff birth. Trying to get the most out of herself at the professional level is emblematic of Stewart’s evolution as both a person and a player. In her third year as a pro, the former #1 pick has officially made the leap from highly touted prospect to dominant league force. The Storm are enjoying their first winning season since 2011, the year after the team won the second of its two WNBA championships (the first in 2004). Stewart, future Hall of Fame point guard Sue Bird (the lone holdover from the title teams), and dynamic young guard Jewell Loyd all made the All-Star team this season, forming a “big three” that the Storm hopes can lead them deep into the playoffs—possibly earning a third championship banner to hang in KeyArena. In the WNBA’s current playoff format, the top two seeds receive byes straight to the semifinals. With this in mind, Hughes says it’s important not to lose focus of the remainder of the season. There’s always room to learn and improve. Last year at this time, the team was struggling with a record under .500, eventually suffering a first-round playoff loss at the hands of the rival Phoenix Mercury. That 2017 team excelled offensively, but wasn’t able to put together a solid defensive plan. This year, with Stewart as a defensive anchor in the middle, the Storm rank as one of the league’s top defensive squads while maintaining their high offensive output. Hughes made a point of improving the defense this year, instilling a philosophy in which defense and offense are viewed as cohesive parts of the game. It’s an integrated approach in which success on one end of the court can translate to success on the other. 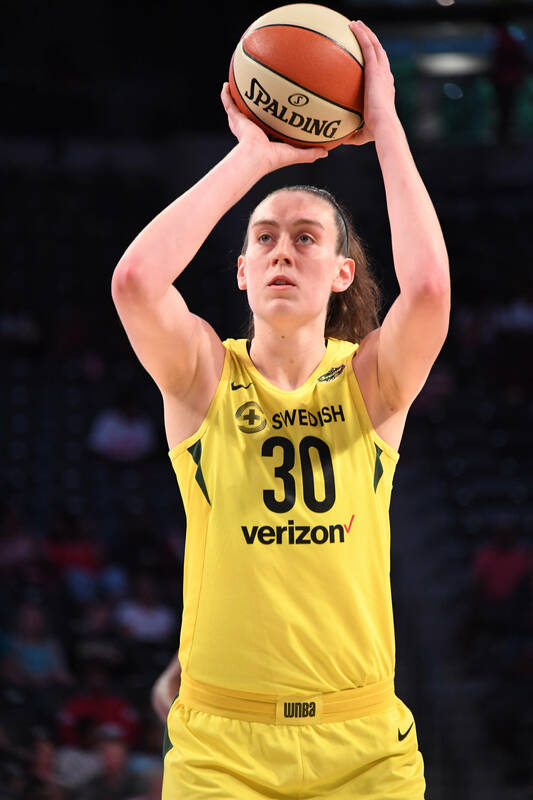 The biggest off-court moment for Stewart came last October when she wrote an article for The Player’s Tribune titled “Me Too,” detailing the sexual abuse she experienced as a young person. Stewart’s courageous honesty earned her new fans and increased her stature as a role model. Now that Stewart, Bird, and Lloyd have returned from All-Star weekend, the season’s second half is revving up. With only a handful of games to go, Stewart and her squad are focused on the task ahead. The team won their first three games out of the break, and are currently on a four-game road trip before coming home to close the regular season with two games in mid-August. But thanks to a hot streak that saw the team win 12 of its last 14 games, the Storm are poised for a push to the WNBA Finals.